We’d love your help. Let us know what’s wrong with this preview of Bride of Gaylord Hall by Saliee O'Brien. All too soon, her hopes turned to chilling fear! 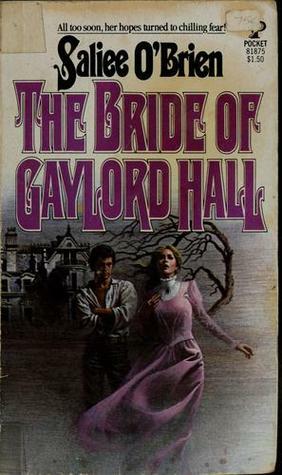 To ask other readers questions about Bride of Gaylord Hall, please sign up. Pseudonym of Frankie-Lee Griggs Janas. She wrote hundreds of novels and short stories, publishing under pseudonyms including Marie Eyre, Francesca Greer, and Stuart Jason. She was born 19 November 1908 in Appleton City, Missouri, the daughter of Benjamin Franklin Griggs and Lillian Maud Bremer. She later moved to Austin, Texas where she met and married Thurlow B. Weed, Jr. They were later divorced, Pseudonym of Frankie-Lee Griggs Janas. She was born 19 November 1908 in Appleton City, Missouri, the daughter of Benjamin Franklin Griggs and Lillian Maud Bremer. She later moved to Austin, Texas where she met and married Thurlow B. Weed, Jr. They were later divorced, and she and her son Thurlow B. Weed III moved to Hollywood, Florida. There she remarried to Leroy Zelley, whom she outlived, and later married newspaper editor Eugene Janas. Frankie-Lee (Griggs) Janas died 15 February 2002, and was buried next to her husband in Hollywood Memorial Gardens. Her first publication was a short ghost story that was printed in her hometown newspaper when she was 12 years old. Her final book was "Cayo", a historical fiction set in Key West, Florida, and published in 1983.